Now lets begin step by step...how to hack websites using SQL Injection Vulnerability. 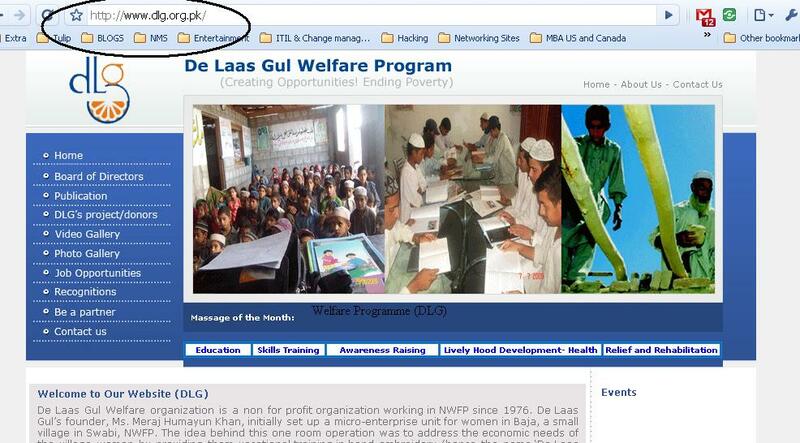 Note that this is for educational purpose and if anybody use this to hack any website, I promise not to prosecute. In many countries it is illegal to use this attack. Here I am not going to share the exact method I have followed. 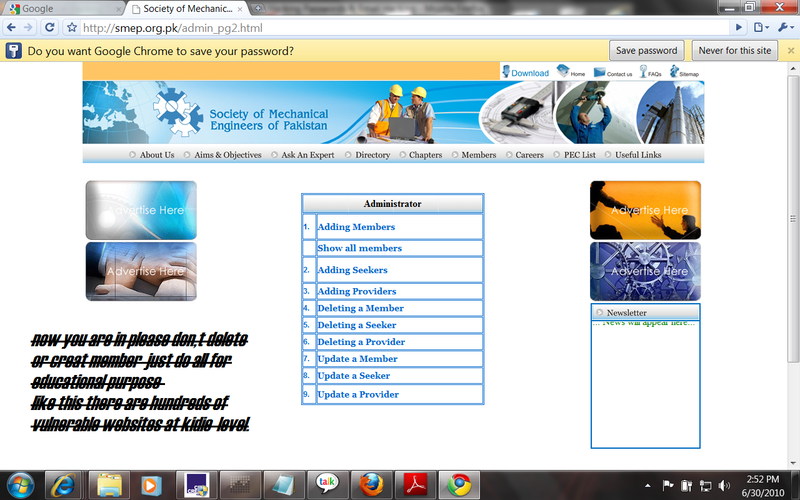 Here are the screen shots for all the pages where we got Admin access. We have not change or deleted any thing. We took almost 55 seconds to get access into administrative access. Check out the below screen shots. System sectors are special areas on your disk containing programs that are executed when you boot (start) your PC. System sectors (Master Boot Record and DOS Boot Record) are often targets for viruses. These boot viruses use all of the common viral techniques to infect and hide themselves. They rely on infected floppy disk left in the drive when the computer starts, they can also be "dropped" by some file infectors or Trojans. These viruses evade anti-virus software by intercepting its requests to the operating system. A virus can hide itself by intercepting the anti-virus software’s request to read the file and passing the request to the virus, instead of the OS. 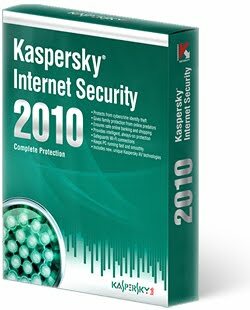 The virus can then return an uninfected version of the file to the anti-virus software, so that it appears as if the file is "clean". These are a new type of virus that destroys the hard disk data content when booted with the infected CD-ROM. Example: Someone might give you a LINUX BOOTABLE CD-ROM. When you boot the computer using the CD-ROM, all your data is gone. No Anti-virus can stop this because AV software or the OS is not even loaded when you boot from a CD-ROM. Most modern antivirus programs try to find virus-patterns inside ordinary programs by scanning them for virus signatures. A signature is a characteristic byte-pattern that is part of a certain virus or family of viruses. A well-written polymorphic virus therefore has no parts that stay the same on each infection.To enable polymorphic code, the virus has to have a polymorphic engine (also called mutating engine or mutation engine). Polymorphic code is a code that mutates while keeping the original algorithm intact. Metamorphic viruses rewrite themselves completely each time they are to infect new executables. Metamorphic code is a code that can reprogram itself by translating its own code into a temporary representation, and then back to normal code again. For example, W32/Simile consisted of over 14000 lines of assembly code, 90% of it is part of the metamorphic engine. Countermeasure is to turn off “Hide file extensions” in Windows. click below on Read Full Article to Get The Key. 2. Mobile Phone with Bluetooth Inbuilt. 3. 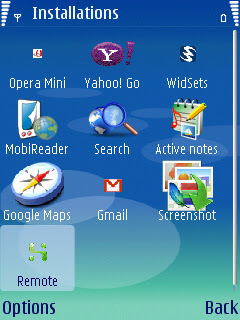 Java Compatibility Mobile Phone. 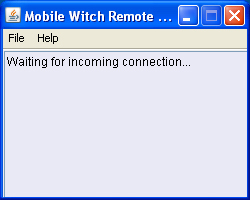 MobileWitch is a very interesting free of charge computer software that allows you to turn your phone into a Pc Remote Control. It will allow you to access various PC application with your Phone. Now you can easily remote control your PowerPoint presentations, Mouse Cursor or simply explore the content of your computer directly from your mobile phone. To take advantage of this software you will need to have a PC and a phone that support bluetooth to send and receive data. The software consist of two parts. There is a client and then there is a server which are both programmed in JAVA. The former is located into a J2ME capable mobile phone with Bluetooth capabilities while the latter is placed in the computer you wish to remotely control. So all you need to do is run the software on your mobile phone with Bluetooth™ support and a Bluetooth dongle installed on your computer. Start the Mobile Application. 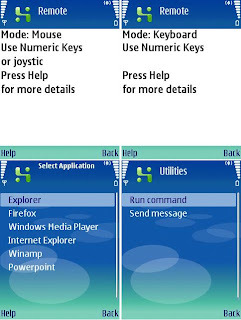 On Nokia phones the shortcut is located in Menu/Applications/Collection. The phone will automatically start searching for active devices. Once both devices are connected you will be abble to acces the Mobilewitch Bluetooth Remote Control Menu from your phone. 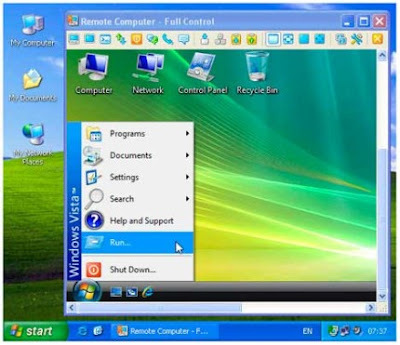 From this menu you will be able to control your mouse cursor, keyboard and the following programs, if installed on your computer: Windows Explorer, Firefox, Window Media Player , Internet Explorer, Winamp and Powepoint. Please note that each application you would like to control has to be first started from the computer and needs to be Always On Top of your desktop. 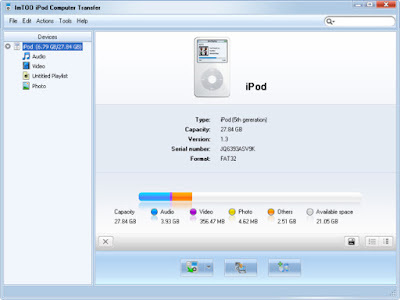 The application does not require any configuration of Bluetooth or Java on both the client or server and the applications it work with are Firefox, Winamp, Windows Media Player, PowerPoint, Internet Explorer and Explorer. Don’t have premium to download on Hotfile? Don’t worry.. Here are the new Premium Link Generator for you.. You will get full SPEED DOWNLOAD ! -This application has premium built in. Bux.to is a PTC site(Paid to click).You get paid to click on ads and visit websites. The process is easy! You simply click a link and view a website for 30 seconds to earn money.In this article i will show you on How to hack bux.to to browse ads.By using this trick you will be able to surf more ads and the most amazing part is that you will not get banned by doing this. Username : of your own choice. How to trak a mobile phone realtime with your PC. How to trak a mobile phone realtime with your PC.No subscriptions needed its totally free. Super Hide IP - one of the best programs for the automatic change of ip address. 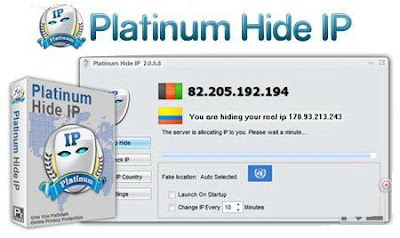 The program will automatically work proxy server and designate it for use in your system. One feature of program - small size and very simple operation. Collection of small utilities for comfortable work with your PDF files. Includes 21 tools for all occasions. PDFcamp Printer (PDF Writer) v2.3 is a quick and easy PDF creation software that converts any type of printable document, including DOC, XLS, PPT, TXT and even HTML, to a universally accepted PDF file with the click of a button. This gives users a convenient and simple way to share any type of Windows document. PDFcamp Printer (PDF Writer) installs and operates as a printer driver, making the creation of PDF documents as easy as printing. PDFcamp Printer (PDF Writer) answers the need of corporations and individuals for a low-cost, yet easy to implement and easy to use, PDF file creation solution. VeryPDF PDF Editor v2.6 is an easy-to-use application designed for users familiar with MS Office and similar applications. VeryPDF PDF Editor provides tools to enable you freely write your own comments to the PDF document and share the comments with others. It also provides a very convenient way for you to add contents or change the text or add text in any font you like, especially in filling out electronic forms, correct spelling errors, delete words completely and so on. You can save, move, copy, paste and print the comments and contents. PDF to Word v3.0 software enable export the text, images and other contents from PDF document into word document, so you can reuse your PDF content, PDF to Word software will preserving text, layout and bitmap images in the generated word document. PDF2Word (PDF to Word) software is a standalone program and does not require Microsoft Word, Adobe Acrobat, or even Acrobat Reader. PDF2TXT (PDF To TEXT) v3.2 software can extract text from PDF files, it does NOT need Adobe Acrobat software. PDF2TXT (PDF to Text) processes at very high speed and you can convert multiple PDF files to text files at one time. Image2PDF Converter v3.2 can create PDF documents from 40+ image formats (include TIFF, JPG, GIF, PNG, BMP, PSD, WMF, EMF, PCX, PIC, etc.). This product may be used as a command line tool, to convert image files to PDF files on the fly. Image2PDF OCR Converter v3.2 provides the most accurate OCR technology to convert image files to text searchable PDF files. PDF2HTML (PDF to HTML) v2.0 software product converts PDF files to HTML files while seeking to preserve the original page layout (as best as technically possible). PDF2HTML enables the conversion of layout originally designed for paper to be used on the Internet. VeryPDF HTML Converter v2.0 is a powerful HTML conversion product. It allows you to create previews or thumbnails of web pages in a number of different formats, such as TIF, TIFF, JPG, JPEG, GIF, PNG, BMP, PCX, TGA, JP2 (JPEG2000), PNM, etc. 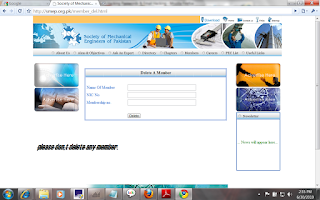 It also allows you to convert web pages to PDF, PS (postscript), WMF, EMF vector formats. PDF Extract TIFF v2.0 software is a simple and affordable extraction tool that facilitates the reuse of PDF files by enabling you to extract images from PDF files and save them as TIFF images. PDF To Image Converter (PDF2Image) v2.1 is an application program based on Windows platform, which can directly convert PDF files to dozens of image formats, it does support whole PDF file to image file conversion, include text, line, arc, ellipse, Bezier, color, image, form and other type elements. AutoCAD DWG and DXF To PDF Converter v2.2 allows you convert DWG to PDF, DXF to PDF directly without need of AutoCAD, it converts DWG and DXF files into vector PDF files, quick and easily. VeryPDF PCL Converter v2.0 quickly converts PCL and PXL print files to Adobe Acrobat PDF files as well as TIF, TIFF, JPG, JPEG, BMP, PCX, PXL files. This is not a raster based conversion. VeryPDF PCL Converter can be used to create either bitmap files (PCX, TIF, JPEG, BMP etc.) at various resolutions or searchable PDF files. PDF to PowerPoint Converter v2.0 can be used to batch convert Acrobat PDF files to PowerPoint (PPT) presentations. PDF to PowerPoint Converter is a professional PDF solution to convert PDF to PowerPoint 2010, 2007, 2003, 2000, etc. formats. 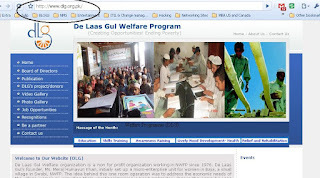 It can retain all the original layouts, text content, images, and hyperlinks in the generated PPT presentations. PDF Password Remover v3.1 can be used to decrypt protected Adobe Acrobat PDF files, which have "owner" password set, preventing the file from editing (changing), printing, selecting text and graphics. Decryption is being done instantly. Decrypted file can be opened in any PDF viewer (e.g. Adobe Acrobat Reader) without any restrictions. Encrypt PDF v2.3 software is a very flexible and powerful program, Encrypt PDF software allows you to encrypt (using standard 40-bit or 128-bit supported by Acrobat Reader 5.0 and up) existing PDFs, set permissions, add user and owner password. 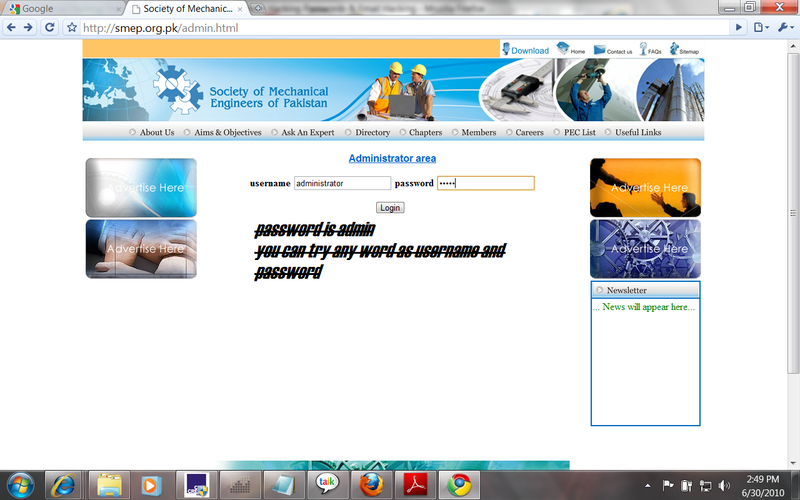 For example you can encrypt a PDF without to allow to print it. The button to print the file will be disabled in Acrobat Reader application, you also can encrypt a PDF allowing the user to read it only if he know the correct password. PDF Split-Merge v3.0 is used to split files by pages, you can split the file into single pages or save every a few pages as a new file, it also can be used to merge multiple PDF files or selected pages from one or more files into a PDF file, preservation of original links, and form fields. VeryPDF PDF Stamp v2.3 lets you stamp watermarks such as "Confidential" on pages that include sensitive information or "Draft" on a preliminary PDF document to be distributed for review. You can stamp PDF document names, revision numbers, Date/Time stamps, pages numbers, contact information or any text that you need added to the file. VeryPDF Form Filler v3.1 enables you to fill out interactive PDF forms without the need for Adobe Acrobat. PDF Form Filler can be used to save interactive PDF electronic forms to your computer to fill in and print at your convenience, send the FDF or completed forms via e-mail, and apply 128-bit encryption or password protection to your PDF documents. Advanced PDF Tools v2.0 is a fast and easy to use utility to maintain your PDF files, it allows you to edit PDF document information fields of single or multiple PDF files, it also allows you to set open action, page layout, page size, page margin, page orientation, metadata, optimize for the web (linearize), compression and others into your existing PDF files. PowerPoint to Flash Converter v3.0 is a powerful application that convert PowerPoint to flash presentations. PowerPoint Converter v3.0 can batch convert PowerPoint files to Flash (SWF), PDF, PS (Postscript), EMF, WMF, MHTML, HTML, RTF, TIFF, BMP, GIF, JPG, PNG, etc. files, PowerPoint Converter supports both GUI and Command Line operations. Radmin (Remote Administrator) is fast and secure remote PC access software that enables you to work on a remote computer as if you were sitting right in front of it and access it from multiple places. Radmin includes full support for Windows 7 (32-bit and 64-bit), file transfer, multi-user text and voice chats, Windows security, Kerberos authentication, 256-bit AES encryption for all data streams, telnet access, multiple monitors support and unique DirectScreenTransfer™ technology. Radmin utilizes the ever-present TCP/IP protocol – the most widespread protocol used in LANs, WANs and the Internet. This means you can access remote PC from anywhere in the world. Radmin is deployed on thousands of corporate PCs worldwide. THIS ONE COMES WITH A KEYGEN. If you cannot open an encrypted PDF document because of losing the password, then PDF Password Unlocker can help you. This software is a handy PDF password recovery software, which can be used to recover PDF password of encrypted PDF documents easily and instantly. Brute-force attack, brute force with mask and dictionary attack are available for you to retrieve lost passwords within few clicks. * Brute-force attack can help you try all possible combinations if you remember nothing about the PDF password. * If you remember some symbols or length of the lost password, brute force with mask attack is better for you to save the PDF password recovery time by restricting the search area. * Dictionary attack allows you to recover PDF password according to default dictionary of the program, besides, you can add your own dictionary to the program in order to shorten the recovery time. * Perfect compatibility This PDF password recovery tool support all versions of Adobe Acrobat including Acrobat 9. 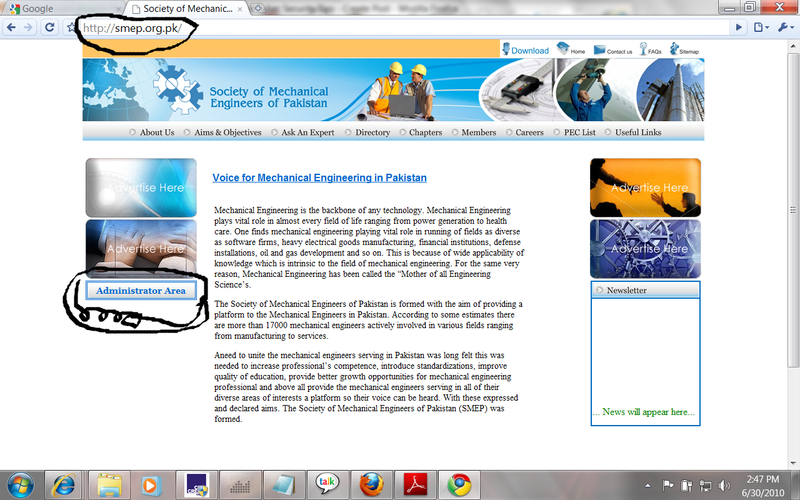 * b for PDF files created by other PDF applications. * Support 40-bit RC4, 128-bit RC4, 128-bit AES, 256-bit AES encryption. 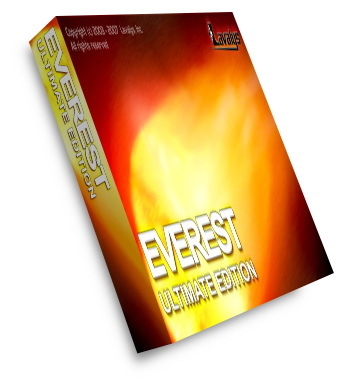 * Work well with Microsoft Windows 2000, NT, XP, Vista, Server 2003/2008, or Windows 7 (32-bit or 64-bit). * Work well with Multi-Core CPU that can speed up the recovery. * Easy and fast to use & best service Save the PDF password recovery process automatically and resume when you run the program again if the recovery process is suspended. * Shut down your computer automatically when the recovery is finished. * Recover PDF password quickly regardless of the length and complexity. * Intuitive interface with good User Experience makes it easy to use. 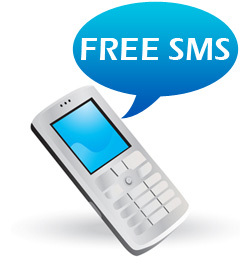 * Professional, timely and free technical support is always for you. Office Password Unlocker is professional password recovery program to recover passwords for Office documents! The Office password recovery program recovers password for Microsoft Word, Excel, Access and PowerPoint with matchless speed that almost doubles that of others. It helps to shoot the lost Office password problems both at home and in Office, making you always at ease!